È stato visto 133 volte. 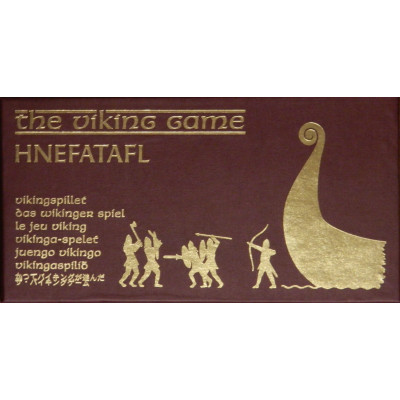 Hnefatafl, also known as The Viking Game, The King's Table or simply Tafl, is one of the rare breed of games with two unequal sides. The defending side comprises twelve soldiers and a king, who start the game in a cross formation in the center of the board. Their objective is for the king to escape by reaching any of the four corner squares. The attackers comprise 24 soldiers positioned in four groups of 6 around the perimeter of the board. All pieces move like the Rook in chess and pieces are taken by "sandwiching" i.e. moving your piece so that an opponent's piece is trapped horizontally or vertically between two of yours. There is a host of information on the Internet about Hnefatafl, including many rule variations that are worth experimenting with. A copy of the game was published in issue #128 of Dragon magazine, Dec 1987 (later republished as part of a boxed set: The Best of Dragon Magazine Games in 1990). One of the oldest games in the world - traced in various versions to the Vikings, Welsh, Saxons, and Irish. The origins of this game can be traced through Petteia, played by the Romans, to the even older versions played by the Ancient Greeks and Egyptians. Derivatives of Hnefatafl include Breakthru, Break Away, Seikkailu Merellä, Tablut and Thud.